The plan had been to go back to Nice Guy Kenny’s gaff and suss out what’s changed since our humdrum pre-Star visit three years ago. Not to be on Monday though, is it, when chefs are busy having a lie in foraging, so we thought we’d give pizza heroes Cal’s Own a go instead – whose name is either genius or dreadful depending on how you view these things – til we discovered that they’ve also got better things to do than feed us at the start of the week. And so, our radar having shifted from ‘posh stuff’ to ‘just give me chips’ we booked a table at Fat Hippo, up there by Grey’s Monument. I know, I know. We hit Peak Burger and the Dude Food Movement (good band name) the moment Maccy D’s tried to convince us it could do Pulled Chicken, so I was half tempted to save both you and my laptop some vital battery power and swerve posting. But perhaps there’s a reader travelling through the grand old city of Newcastle who’s also failed to get into House of Tides and so has opted for a well-priced, well-cooked meat disk for tea instead, and to them I say: I’m sure MeatLiquor will find its way to Tyneside soon. Until then, Fat Hippo is doing a fine job of things on the burgery front, and it’s a busy one on our visit, even for a Monday. Probably full of chefs. 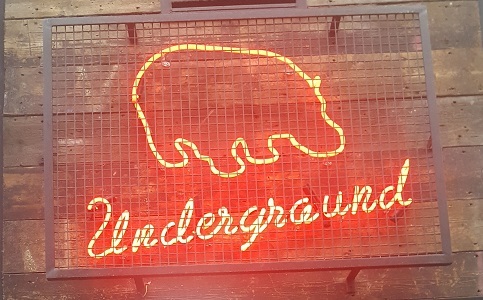 Cellar-level scoffing, bare-brick walls, bit of neon – you know the score – but someone’s either sourced good cow or seasoned the raw goods knowingly here. Peppery and almost offally, this was standout stuff for a burger. 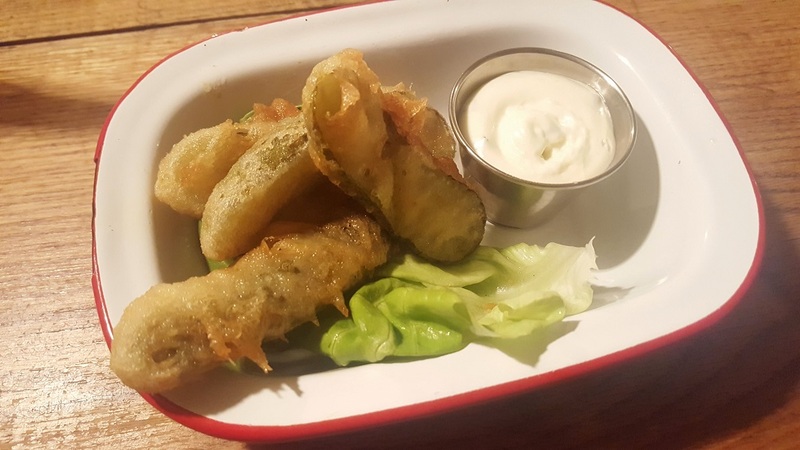 It’s a tenner including chips fer yer basics, with prices heading north of that if you want to pretend you’re on Diners, Drive-Ins and Dives. In fairness, nothing gets too daft, but there’s no place for peanut butter on a burger. 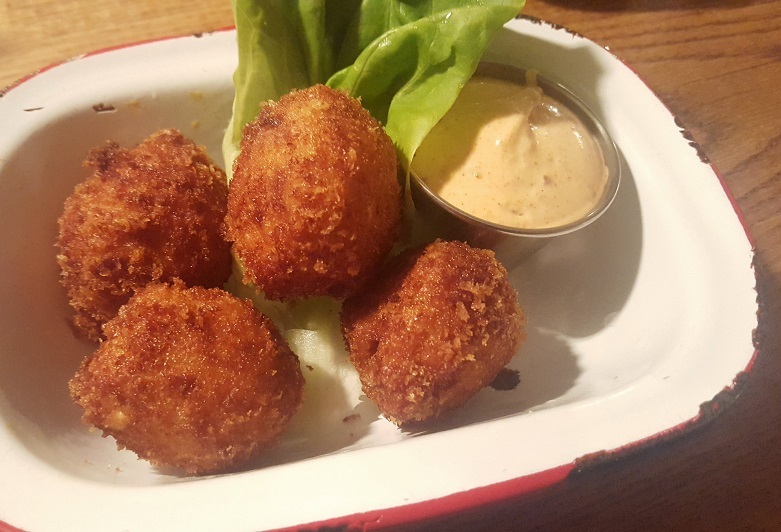 Mac n’ Cheese Balls (they mean macaroni) were crunchy, gooey orbs and sound for £4.50, but our Deep Fried Gherkins (£4, enamel tin of course) were flaccid and limp. Hey, we’ve all been there. 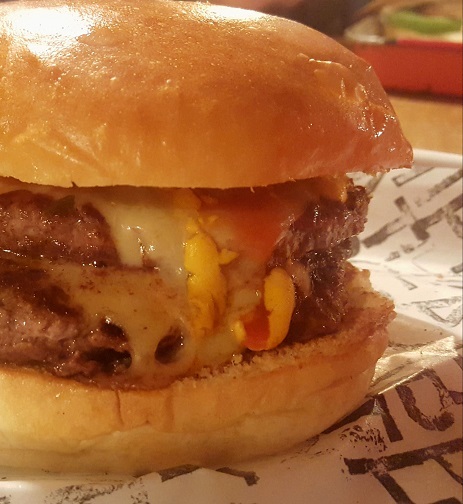 Those burgers though: fine things. Booze: plenty of cans for around 4 quid; a short wine list – 3 reds, 3 whites – including a reet good Sauv Blanc for (top price) £18.90. More of this rubbish on Twitter.